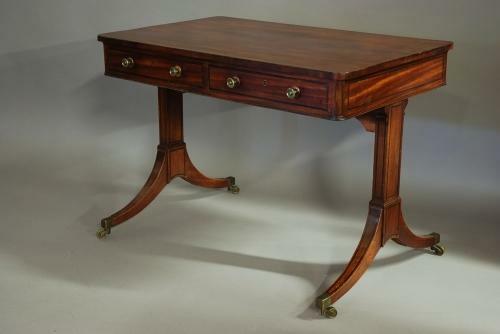 This table consists of a fine quality veneered mahogany top. Below this are two oak lined drawers with two dummy drawers to the opposite side, all with inlaid ebony stringing and each drawer has two brass knobs. The end panels are veneered with well figured mahogany and also inlaid with ebony stringing. The elegant end supports, of Georgian design, are again inlaid with the same ebony stringing and lead down to outswept legs terminating with brass box castors. This is a versatile table due to not having a central stretcher to the base so is easier to sit at than some tables. This piece is in very good condition and can go straight into a home.